Turn the fish on its side and remove the head. Wash the fish and clean the slit very thoroughly. With a sharp knife, cut through the skin right around the fish, just where the "fringe" meets the flesh. Be careful to cut neatly and to cross the side cuts at the tail or it will be difficult to remove the skin later on. Sprinkle the fish with salt and freshly ground pepper and lay them in 3 inches of water in a shallow baking tin. Bake in a moderately hot oven for 20 to 30 minutes according to the size of the fish. The water should have evaporated as the fish cooked. Check to see whether the fish is cooked by lifting the flesh from the bone at the head; it should lift off the bone easily and be quite white with no trace of pink. Meanwhile, melt the butter and stir in the freshly chopped herbs. Just before serving catch the skin down near the tail and pull it off gently (the skin will tear badly if not properly cut). 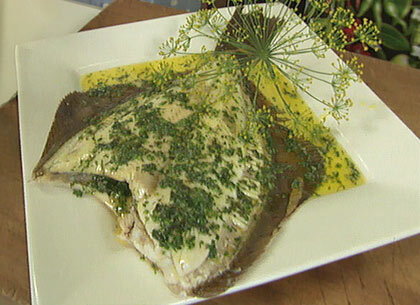 Lift the fish onto hot plates and spoon the herb butter over them. Serve immediately. Chef Darina Allen notes: This is a very simple "master recipe" which can be used not only for plaice and sole but for all very fresh flat fish, e.g. brill, turbot, dabs, flounder and lemon sole. Depending on the size of the fish, it can a starter or a main course. It is also delicious with hollandaise sauce, mousseline or beurre blanc. This segment appears in show #3111.